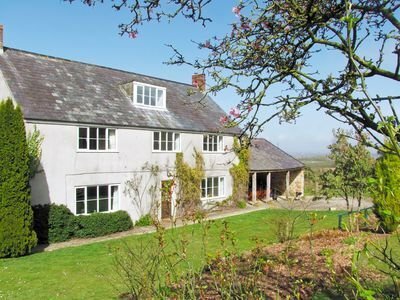 If you're looking for a large holiday cottage on the south coast, with rural setting, and close to the coast - you might be interested in "Purcombe Farmhouse" in Whitchurch Canonicorum near Bridport, Dorset. Purcombe Farmhouse sleeps 12 people and can be found in the Marshwood Vale; just a couple of miles away from the coastal paths of the Jurassic Coast. Purcombe Farmhouse is a semi-detached farmhouse, and is set on a working farm. The accommodation gives you the rural tranquillity, and the features you'd expect from an old farmhouse. You get a wood burning stove in one of the two living rooms; with the second living room having an open fire - an ideal place to spend a chilly evening, and with two living rooms you won't be getting under each others feet! There is also central heating to keep the rest of the property warm. The kitchen features a Rayburn, along with a couple of electric cookers. You've also got some labour saving devices like a washing machine, tumble dryer and dish washer. A satellite TV and DVD player are also included. And there is Wi-Fi so you can all stay online during your holiday here. Purcombe Farmhouse boasts a large garden with furniture and some good views, where you can sit with a nice cup of tea and drink in those surroundings. Purcombe Farmhouse is pet friendly too. You may just want to stay at Purcombe Farmhouse and enjoy a few days of peace and quiet, but should you want to venture out and see what's going on in the area, the Jurassic Coast is only a couple of miles from Purcombe Farmhouse; and from hear you can walk to Lyme Regis in one direction, and West Bay in the other direction. The shops are 3 miles from Purcombe Farmhouse; and the pub and restaurant are about 1½ miles away. The towns of Bridport, Beaminster and Ilminster are all a short drive away. And Dinosaurland, Forde Abbey & Gardens, Broadwindsor Craft Centre, Yeovil Fleet Air Arm Museum, and Haynes Motor Museum are all close by too. So there's plenty going on in the area to keep you busy! Should you fancy a few days at Purcombe Farmhouse, holiday start on a Friday, and short breaks are available all year. Should Purcombe Farmhouse not be to your liking, but you fancy staying in the area around Bridport, you might well be interested in the cottages below. All these cottages are within a few miles of Purcombe Farmhouse.